There are several angles and closeups if you click the link. Can anyone tell me what this sculpture is? It's been in my family since the 60's. Here is a link to several photo's, www.ddagmijco.com/BronzeSculpture.html The mark on the bottom is hard to make out, actually it can be seen better in these photo's than it can by the naked eye. 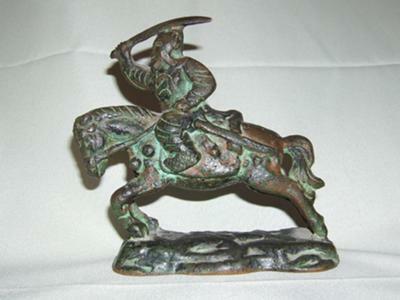 It is recommended to try asianart.com with metal items. Copy and paste this in your browser to see more photo's of the sculpture.